If Milan 2010 were introduced as a new Crayola color, some might argue that "Ash Cloud Grey" would be the most appropriate shade. Air travel through northern Europe at the tail end of the fair was an impossibility due to the eruptions of Eyjafjallajokull in Iceland, so rather than continue to reflect on the city-wide scope of international design on display, Salone ended with a hard-stop for many. Attentions were turned to making one's way—if not back home, then somewhere else—and labyrthine terrestial voyages ensued. Rather than let the volcanic dust remain the predominant shade, I've selected some of the best and brightest that I saw. Click through to the slideshow to see a selection of hue-tiful pieces that truly popped. It doesn't look like a sheet of loose leaf, but this task light from Swedish lighting company Wästberg and multi-disciplinary Swedish designers Claesson Koivisto Rune is, in fact, made of paper. Developed by Södra, a forest industry company (Swedish, natch), the material is called DuraPulp, a compound made from 100% renewable fibers that can withstand heat and water, but is totally biodegradable. Designer Stefan Diez expanded upon his already illustrious collaboration with e15 this year, introducing a handful of new items. The Jean stool is made of oak-veneered plywood and comes clear-lacquered or, as seen here, in bold berry blue. Designer Patricia Urquiola is absolutely everywhere. I don't know how she manages to produce so many new designs for so many different companies that are consistently pretty wonderful. Moroso had an amazing booth this year, and Silver Lake—named after the hip Los Angeles neighborhood—was a bright offering that evoked the effortlessly cool spirit of mid-century modernism in southern California. Pierre Charpin designed two lined rugs for Ligne Roset this year, each hand-tufted 100% New Zealand wool, and each balancing a repeating geometric design with a hint of intrigue. There were actually a handful of yarn lampshades at the fair—the others I saw were from Mut and Ana Krâs at the Salone Satellite—which, as a novice knitter and fan-of-craft, I loved. Granny, a chunky burgundy pendant by Pudelkern Design for Casamania, was inspired by cold winters in the Alps, and made from fire retardant wool. Though Katy Meyer-Brühl's Ladybug was introduced last year, this textured upholstery with oversized piping adds a new dimension to the gently undulating sofa for Brühl. The Cassina showroom on Via Durini had one of my favorite window displays in Milan. Imagine a storefront chock full of these beyond-beautiful Le Corbusier-designed LC2 armchairs, updated with brilliant contrasting frame and cushion colors. Moustache made waves with its debut in Milan last year, and the French company introduced a new selection of designs at Superstudio's Innovation / Imagination exhibition to complement their existing collection. 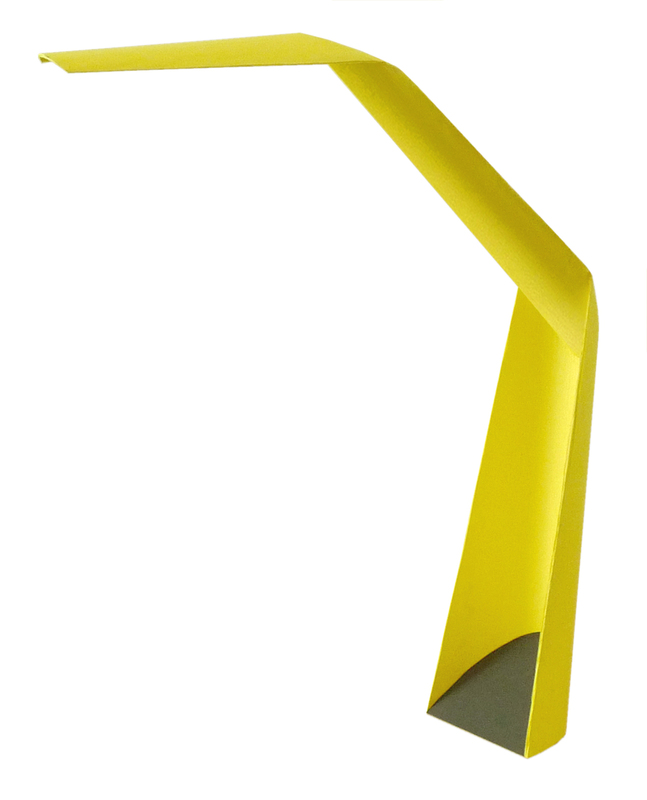 Bertjan Pot looked to photographer's umbrellas and light reflectors to create the flexible Fold Up lamp. Alessandro Dubini's Aster clothes stand for Zanotta is reminiscent of the Italian company's 1978 Sciangai coat rack by De Pas, D'Urbino & Lomazzi. The "wings" on Valdemar, this new upholstered chair from industrial designers Martin Kechayas and Christian Nørgaard for Normann Copenhagen, make sitting into a blissfully solitary pleasure. The upholstery covers the legs, too, giving a complete color block look, and it's comfy, too; You can lean to either side and settle in with a book and forget about the rest of the room. Bosa, Venini, Laboratorio 2729 all collaborated to create the ceramic candle holders of Luca Nichetto's Essence Cinque series. The modular items in the slick, colorful collection is meant to evoke the shape of pieces created by being poured into a mould. British designer and super normal champion Jasper Morrison teamed up with Italian brand Cappellini to create Camp, an almost-loosely covered sofa with ingenious magazine pockets sewn into the outside of each arm.